The major focus of Dr. Yamanouchi’s lab is to understand the pathogenesis of abdominal aortic aneurysm and restenosis after angioplasty including balloon angioplasty and stent placement, especially through the calcium regulation in the arteriosclerotic disease. 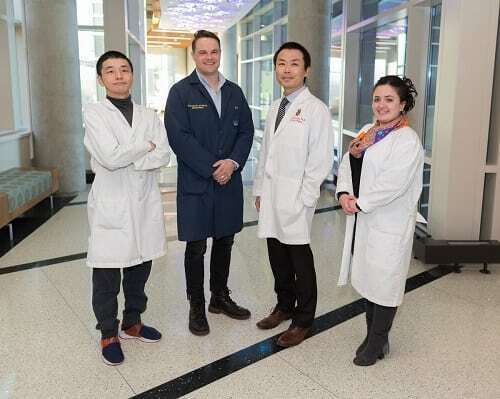 They are also devoted to the development of novel materials for vascular bypass graft and gene delivery method to treat the patients who suffers peripheral arterial disease. Abdominal aortic aneurysm (AAA) is among the 20 leading causes of death in the United States. Currently, open surgical repair and endovascular placement of a stent graft are the only proven treatments for AAA. The significant morbidity and mortality associated with treatment emphasize the need for alternative therapeutic strategies. 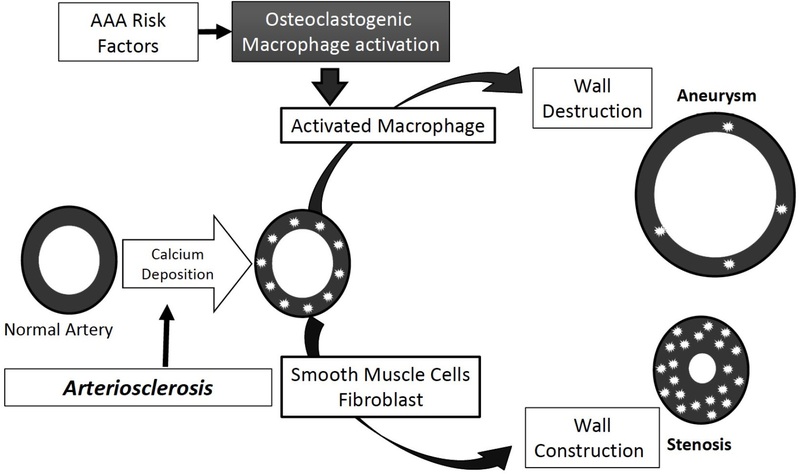 Recent studies demonstrated the involvement of balanced mineralization in diseased arteries through the tight control of calcification by osteoblast-like and osteoclast-like cells (OCLs). OCLs are similar to osteoclasts but occur in tissues other than bone, differentiate from monocyte/macrophages, and histologically are multinucleate cells positive for tartrate-resistant acid phosphatase (TRAP) staining. Our lab is interested in further characterization of these cells that we refer to as TRAP-positive macrophages (TPM). We previously demonstrated the role of the receptor activator of nuclear factor kappa-B ligand (RANKL) in stimulating the differentiation of macrophages into TPMs in vitro. RANKL is generally expressed in the bone and is essential for formation of mature osteoclasts, which express proteolytic enzymes such as Cathepsin K and matrix metalloproteinase 9 (MMP9), and facilitate migration of osteoclasts to resorption sites through the extracellular matrix. We demonstrated that TPMs play an important role in the development of aneurysms in the CaPO4-induced mouse model of aneurysm, but the involvement of TPM activation in dissecting AAA is still unclear. Our lab uses Angiotensin II (Ang II)-infused apolipoprotein E-deficient (apoE−/−) mice as models of dissecting AAA. Medial accumulation of macrophages and dissection are early events in Ang II-induced AAA in mice, and this model more closely resembles aortic dissection than common aneurysm formation in humans. The central hypothesis of our research is that TPM activation contributes to aneurysmal degeneration, and thus inhibition of TPM activation leads to suppression of AAA. Ongoing research in the Yamanouchi lab is directed at understanding (1) the role of RANKL-induced TPM activation in dissecting aneurysm, and (2) the role of TPM activation in the increased risk of AAA associated with smoking. In addition to mouse models of aneurysm development, our lab utilizes human clinical specimens to correlate animal model results to human disease. Nanobubble (NB) water refers to a liquid containing small bubbles typically with <200 nm in diameter. Unlike larger sized microbubbles which disappear relatively quickly, nanobubbles remain stable in water for a long time. Our collaborators have developed a novel method to create oxygen containing NBs in the single-nanometer range without any additives. Using the ΣPM – 5 device that employs the water hammer method, in which pressurized oxygen-saturated water collides at high velocity, we can produce pure oxygen-containing NB water. To the best of our knowledge, the ΣPM – 5 device is the first device to create single-nanometer range NBs. 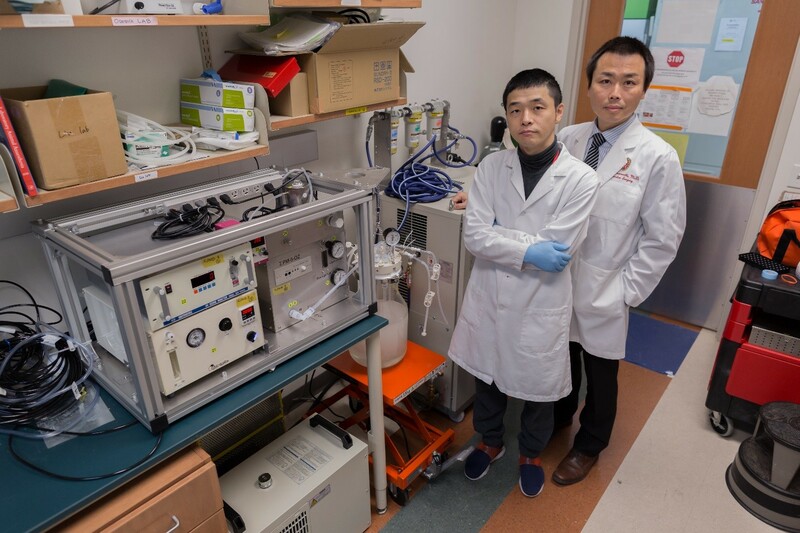 The Yamanouchi lab, in collaboration with Sigma Technologies of Japan, has the only ΣPM – 5 device in the United States. Oxygen nanobubble water suppresses HIF-1α accumulation in hypoxic cancer cells. (A) HIF-1α and HSC70 protein expression in the EBC-1 lung cancer cell line and MDA-MB-231 breast cancer cell line was evaluated by western blot analysis after 6 and 24 h of exposure to hypoxia. 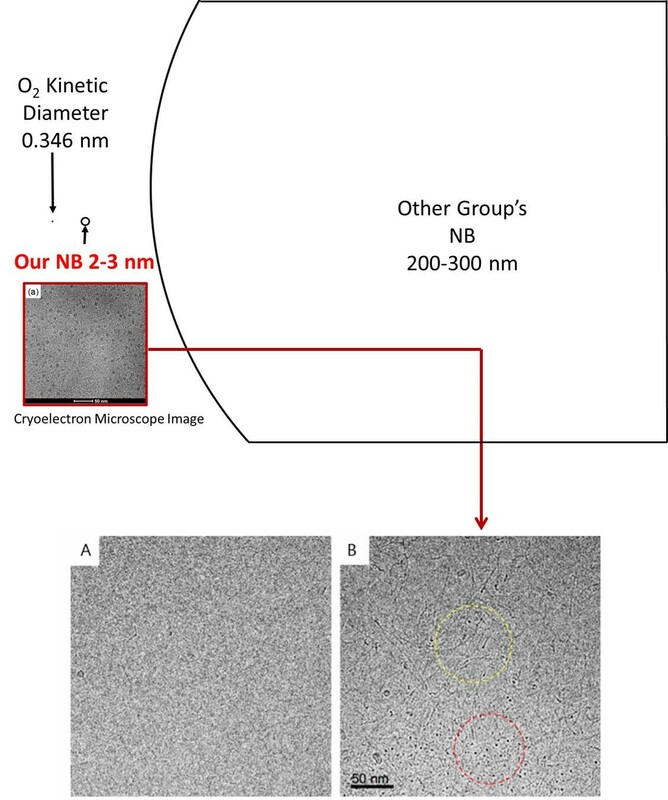 Oxygen nanobubble medium clearly suppressed HIF-1α induction under hypoxic conditions. 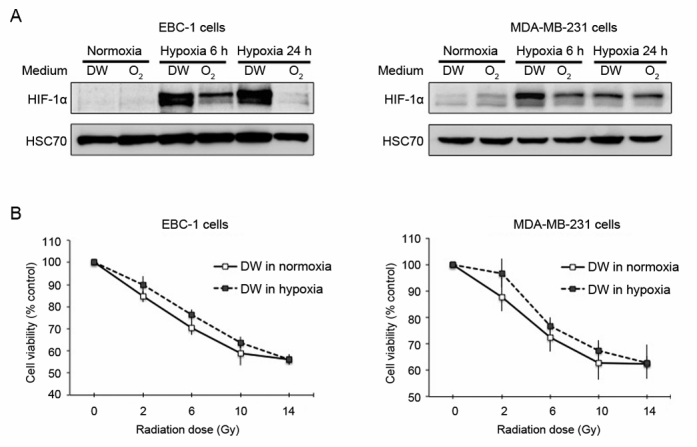 (B) Hypoxia-induced radiation resistance was validated in both the EBC-1 and MDA-MB-231 cells. Distilled water, normal medium; O2, oxygen nanobubble medium. Yamanouchi et al. Int. J. Oncol 2018. Cardiovascular disease (CVD) and cancer are the top two leading causes of death in the US. While the etiology and pathology of these diseases are fundamentally different, tissue hypoxia is a shared pathogenic feature. Ischemic tissue is injured by the shortage of oxygen supply that is required for cellular metabolism, resulting in necrosis of the tissue. If hypoxia-induced tissue damage persists, it eventually becomes irreversible unless oxygenation is restored. Hypoxia has also emerged as a driving factor in tumor malignancy. Increased oxygen demand and limited oxygen diffusion, resulting from rapid proliferation of tumor cells, creates an oxygen deficit in the tumor microenvironment. Hypoxia subsequently alters cancer cell metabolism, and promotes the development of aggressive phenotypes and therapeutic resistance. Under hypoxic conditions, cellular homeostasis is regulated through increased expression of hypoxia-induced factor-1α (HIF-1α). HIF-1α is a transcription factor that is critical in driving the expression of hundreds of genes regulating the adaptive cellular response to low oxygen including angiogenesis, metabolism, proliferation, and apoptosis. In CVD, It was previously demonstrated that vessel wall hypoxia resulting from aneurysm formation may contribute to inflammation and vessel wall weakening. In cancer, elevated HIF-1α expression was found in a variety of tumor biopsies and associated with an increased risk for metastasis and mortality. Consequently, oxygenation of tissues may function to counteract the hypoxia-associated pathologies in CVD and cancer. To test these hypotheses, our research is directed at understanding the effect of oxygen NB water on hypoxia-associated pathologies in aneurysm, limb ischemia, and tumor progression.